OK, it is a poor photo, but I had to maintain a distance so the chick wouldn't become scared and take flight before it was ready. 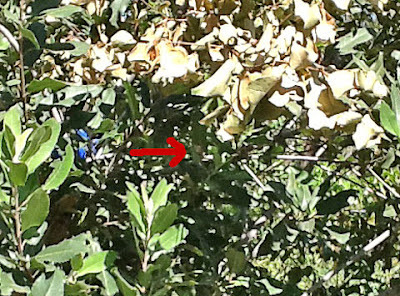 If you look closely, to the right of the arrow is a leaf and then a pale spot–the pale breast feathers of a Allen's hummingbird fledgling. The nest is about a foot beyond the right side of the photo. Last week, this young hummingbird and its sibling were still in the nest. Yesterday, the older chick fledged. If flew to the far side of the toyon bush. Though it stayed in the 'home' bush all day. It definitely was out of the nest. The smaller chick, was actually from an egg laid two days later than the first. Usually Allen's hummingbird eggs are laid on two consecutive days. It has always been quite a bit smaller. Because of its pale brown coloring, I've taken to calling her 'Mouse'. Though her sibling was calling and mom was encouraging, Mouse stayed in, on or next to the nest all day yesterday. She tried exercising her wings, but it was obvious she just wasn't ready to fledge. Early this morning she was still sitting on the nest's edge. It is a scary, yet exciting thing to leave the nest. These chicks are less than a month old. Before the week is over, they will be on their own.